Safety and responsibility are key values in VR Group. VR Group is an important actor in Finnish society and responsibility is closely related to all activities of the Group. Responsibility in VR Group covers five different themes. Responsibility means ensuring safety, customer satisfaction, workplace well-being, environmental friendliness and transparency in operations. There were no serious rail accidents in Finland in 2015. The most probable and dangerous risks in rail traffic are connected with the coordination of rail traffic and track work and with level crossings. The work accident frequency target was not exceeded. During 2016, the regulatory environment will change and Trafi will become more of a supervisory authority. The change will emphasise the responsibility of railway actors and present new demands for the VR Group’s railway safety management system. All three business operations developed their interaction and activities with their customers. In passenger services, this was seen in the renewal of train ticket pricing in February 2016. In 2015, there were discussions with personnel on what sorts of values guide our everyday activities and work methods could be developed. We also received a lot of suggestions for developing dialogue between the personnel and management, as well as between different units. In the personnel survey, results on supervisory work, occupational safety and communications improved. However, the personnel’s belief in the future of VR Group and their willingness to recommend their job to others decreased. Of the objectives for the environmental promises that last until 2020, the share of renewable energy in VR Group's energy consumption and the share of waste ending up at landfills have already been achieved. There were no major leaks in the transport of hazardous substances. The ethical guidelines for the whole VR Group were renewed in 2015. The guidelines concern all personnel and everyone is required to complete a coaching course on these in 2015. VR Group’s anti-corruption guidelines were also renewed. New suppliers for VR Purchasing must always conduct a self-assessment, and a risk analysis is made on them as well. All suppliers must comply with the VR Group ethical guideline on purchasing. The suppliers also pledge that their supply chains comply with the ethical guideline. Companies belonging to VR Group pay their taxes and other statutory charges in accordance with the laws and regulations in their home countries. The objective of the Group is to handle its taxes and other statutory payments correctly and on time. The focus of VR Group’s business is in Finland, but the Group also has operations in Sweden, Estonia and Russia, and in 2015 there were operations in Hungary as well. The Group’s centralised finance unit is responsible for matters of taxation in Finland and they utilise advisers in questions that are open to interpretation. In other countries, the local finance units deal with matters of taxation and statutory charges. In 2015, VR Group comprised companies registered in Finland, Sweden, Russia, Estonia and Hungary. Finnish companies accounted for 92.6 per cent of the Group’s consolidated turnover. In 2015, the Group’s result before taxes was EUR 42.8 million. Payments of income tax for the fiscal period totalled EUR 7.3 million. By the end of the year, the Group had EUR 1.8 million in deferred tax receivables and EUR 84.9 million in deferred tax liability. These taxes were paid almost entirely to Finland. The largest of the taxes paid for 2015 was the excise duties on fuels that is part of the energy taxes, totalling EUR 12.7 million. A total of EUR 14.4 million in energy taxes was paid to Finland, with excise duties on electricity accounting for EUR 1.8 million. The electricity used by rail traffic is exempted from excise duties. VR Group owns a large number of properties in different parts of Finland. A total of EUR 2.2 million in property taxes was paid to different municipalities. Of the taxes that were paid, the accounting period included EUR 66.6 million in VAT and EUR 125.1 million in withholding tax. Employers' contributions (pension insurance contributions and other personnel expenses) totalled EUR 95.3 million in 2015. Of this, social security contributions accounted for EUR 8.3 million. The State of Finland was paid EUR 100 million in dividends for the year 2014. Track taxes and access charges totalled EUR 44.5 million. 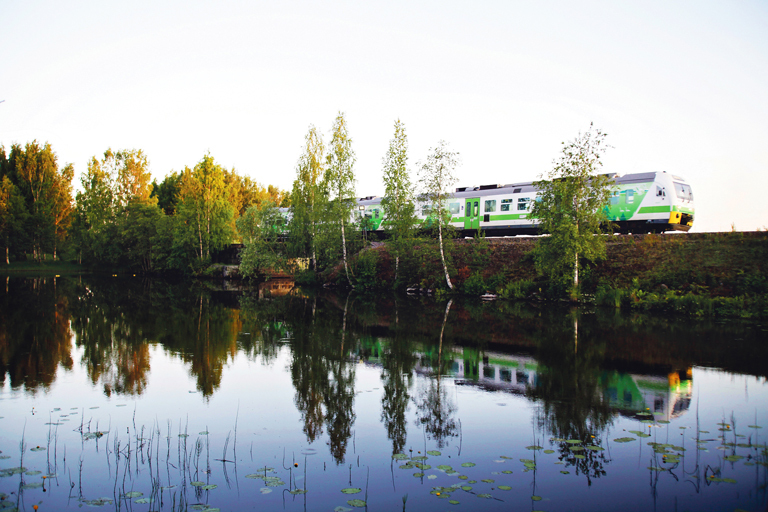 The total includes EUR 1.1 million in track tax and EUR 4.2 million in investment tax for the track section between Kerava and Lahti. Other charges to the authorities, such as licence fees collected by the Finnish Transport Safety Authority, totalled EUR 0.5 million.